Penhein Glamping01633 400581work GlampingAt Penhein Glamping, six luxurious Alachigh tents are tucked away in the woods surrounded by fields and meadows in the Monmouthshire hills. Custom-made to keep you warm and dry, with comfy beds, an en suite loo, wood-burning stove, running water and a well-stocked kitchen, the tents at Penhein have everything you need to feel at home in the Great Outdoors. Also in the peaceful coppiced woodland on family-run Penhein Farm are Petro, a huge communal tent, a shared shower block with underfloor heating, hot monsoon showers and a roll-top bath, and a separate cooking facility (the ‘cheat’s kitchen’ for those not up for the culinary adventure of cooking on the wood-burning stove in each tent or fire pit just outside). Beyond the glampsite, guests are free to roam the 450 acres of farmland, wandering down nature trails or scaling hills to the top of the valley, where they can enjoy magnificent views of the River Severn and surrounding countryside. Or enlist on one of the many activities run on the farm: there’s clay pigeon shooting, foraging, bushcraft, printmaking and campfire cookery to choose from. Penhein is run by James and Helen Hearn, whose are committed to providing an authentic yet fabulous camping experience for their guests, complete with rustic charm and rural abandon but not without a few little luxuries and some home comforts. Top of the list of things to bring? An adventurous spirit! 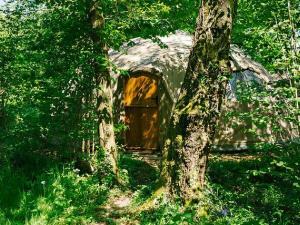 At Penhein Glamping, six luxurious Alachigh tents are tucked away in the woods surrounded by fields and meadows in the Monmouthshire hills. Custom-made to keep you warm and dry, with comfy beds, an en suite loo, wood-burning stove, running water and a well-stocked kitchen, the tents at Penhein have everything you need to feel at home in the Great Outdoors. For information: Penhein prices range from £120 per unit per night to £198 per unit per night according to season. Minimum stay 2 nights. Each of our Alachighs ('alla-cheeg') sleeps up to four, with a large comfy sofabed for an extra adult or two small children if required.